Ahem, still working on Elizabeth's birthday socks for the Yarn Along this week. Only another 3 days until her birthday, so I'm getting close on time, but since I'm nearly ready to begin the toe of the 2nd sock, I'm not too worried. For my reading this week, I just started Weapons of Mass Instruction by John Taylor Gatto. Eileen, of Little Acorn Learning, Valarie, of Jump Into A Book, and I were talking over the weekend about reading this book, and quickly our plan turned into a Virtual Book Club on Facebook. We are still welcoming new members before our first book discussion on 2/4 so please join us if you are so inclined. The book club button on the sidebar of my blog will remain if anyone would like to join for a later book. The cowl also rolls really badly making it impossible to see the rainbow, but I suppose it adds a bit of neck warmth. It was a quick knit from leftover yarn so it was hard to be too disappointed. I love your socks and cowl! The colors you used can't help but put a smile on your face, they are such happy colors! That yarn is beautiful! I need to make myself some socks! 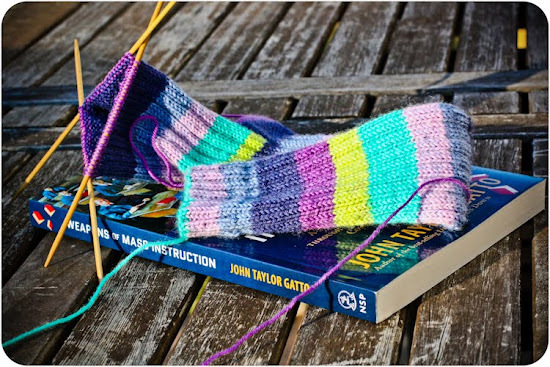 Everyone seems to be knitting socks recently, and I need to figure out a way to make myself some! Beautiful projects! 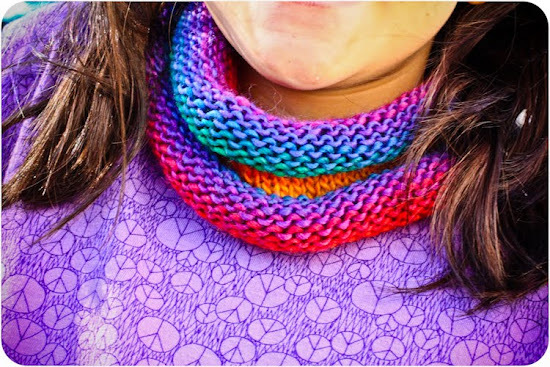 I like the rainbow cowl, the colours are so vibrant. The socks look lovely and long. Oh you make such lovely socks! Love the cowl also, had the same idea to make one for my son but haven't found the rainbow yarn yet. 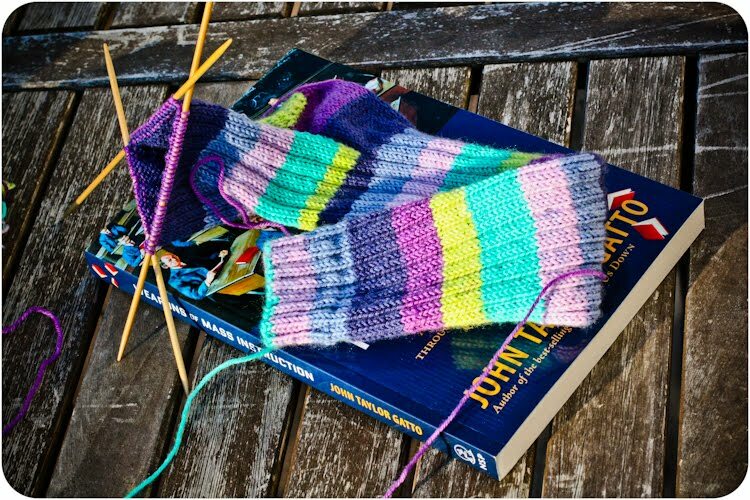 Great knitting, love your socks. I have just bought some green yarn for my next socks. Oh but look how she is beaming in her new cowl! 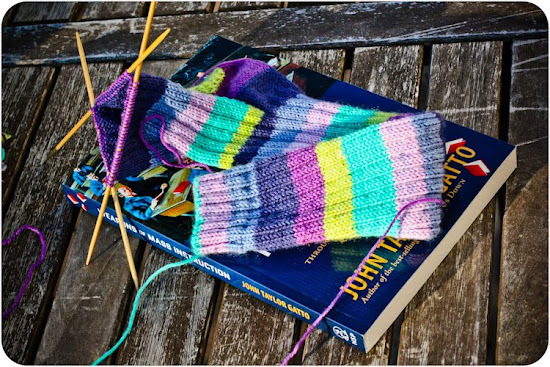 Love the socks - I'm sure you'll finish in time for the birthday. The books sounds interesting - I put it on hold at my library. I do so enjoy that rainbow cowl. I think it is so darling and really helps brighten the winter months. Congrats in getting those socks almost done; they look lovely. 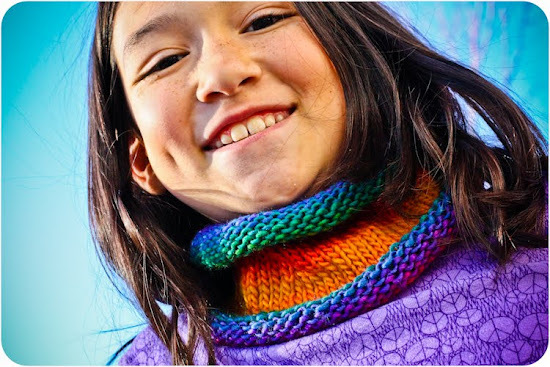 Loving the rainbow cowl! I think cowls are so much more practical for the under-12 set. The agita I get trying to keep a scarf on my kiddos is more than I like to have in the mornings. We must have shopped at the time at KP. I just knit my daughter a vest out of Chroma(lollipop colorway) and I am going to be knitting a pair of socks out of the same Felici colorway. A few rows of gater at the edges should keep the cowl from rolling. Too bad about the sizing. I also love the rainbow cowl - what beautiful colors - that books sounds great - I will see if our library has it today. I love the rainbow cowl! It looks so vibrant especially during this drab day (here in pa)!! the cowl is lovely, but then i just love rainbows so much. and i have to say i adore all the socks in your header. beautiful! I know I say this every week but I am LOVING the yarn you are using! So bright & cheery. I think I may have to just get myself some :-) The cowl came out so pretty. I've been thinking of knitting up the same pattern as well. I hope everyone is feeling better! I can't resist colourful yarn. So much fun to knit with. The cowl looks gorgeous. Your banner is inspiring to get some of my homemade socks on feet and take a photo. Those socks are so beautiful. I'll have to check out that book! Hopefully in time to join the club.